I love flowers. Especially tulips and poppies. 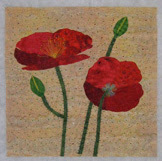 I saw a wonderful image of 2 poppies and I thought what a great quilt this would make. I have also found a new love, beads. I just can’t stop buying them, especially when they are on sale at Michael’s. I’m thinking that I’ll create another poppy quilt similar to this one and attach them to an even larger quilt. Again so many ideas and so little time. 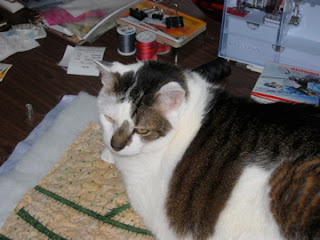 Tootie gave me advice on bead placement and was also a tremendous help holding the piece in place while I beaded.